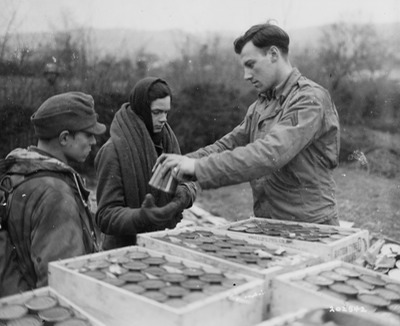 Complete C ration, Januari 1945. Note that the domestic cardboard shipping cases are shown in the back. Four B-units. 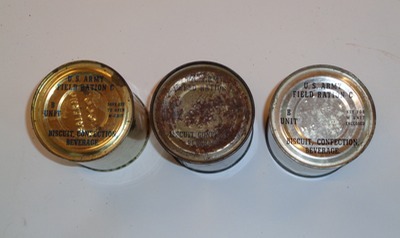 The row of cans showing the gold lacquer (left), camouflage coating (middle) and the clear lacquer (right). The opened can has a clear body, but was closed with a gold lacquered top and bottom. Labels on the top end of the cans. Left: blue lithograph used by the Salerno Biscuit Co., embossed with COCOA. No date of packaging embossing. Middle: A camouflaged can with the same lithograph as the Salerno can, but in black ink. Embossing reads COFFE [sic], packed in February 1944. 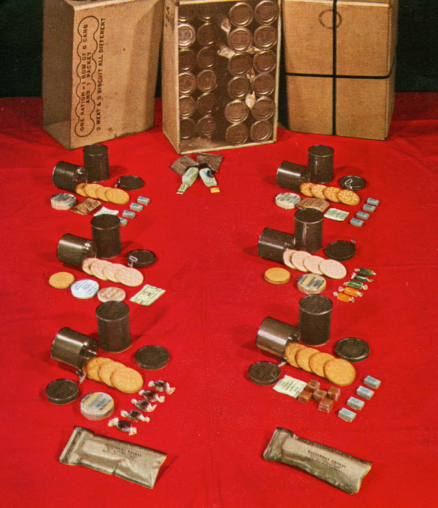 Right: Black lithographing with CB embossing for cocoa beverage, December 1942. Styles of keys used attached to the bottom of the cans. Official Signal Corps photo of an accessory kit. Salt tablets are not included yet. Late accessory kit. This is one of the seven packages that did not includes the can opener. The sugar coated chewing gum was introduced very late in the war. It contains the salt tablets instead of the Halazone tablets. Another late accessory kit, although it still contains the Halazone tablets. Note the three cigarette packages with 3 cigarettes each. 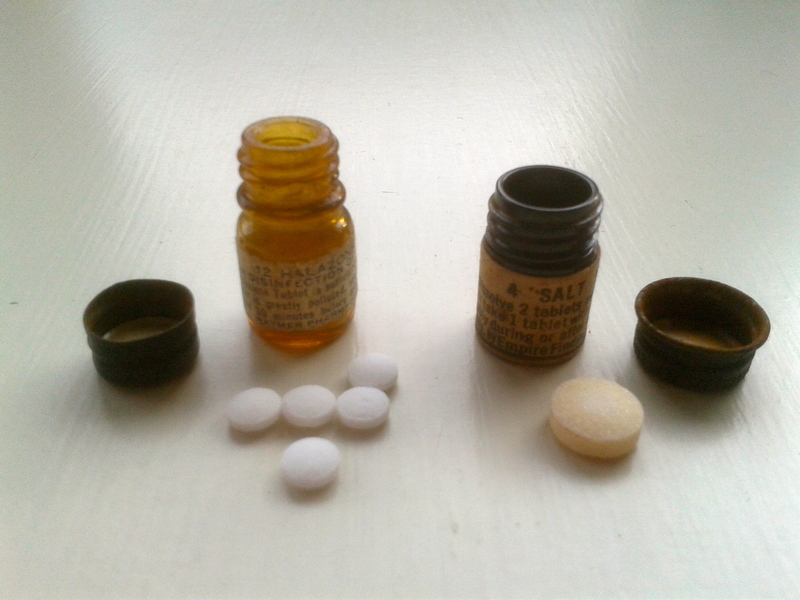 Halazone tablets and salt tablets. Three packeges of 3 cigarettes each came with the accessory kit. In 1943 one of such a package (3 cigarettes) were packed inside two of the B-unit cans for a short while. 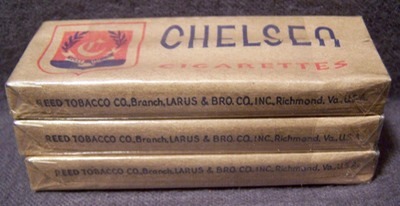 Two packages holding 9 cigarettes each. One of these packages came with the accessory kit. A small booklet with ten matches shown front and back with the malaria warning. Last picture shows the matches. Water is poured into canteen cup. Field test 1939. Coffee is added to the water. Field test 1939. Then the sugar tablets are used to sweeten the coffee. Field test 1939. 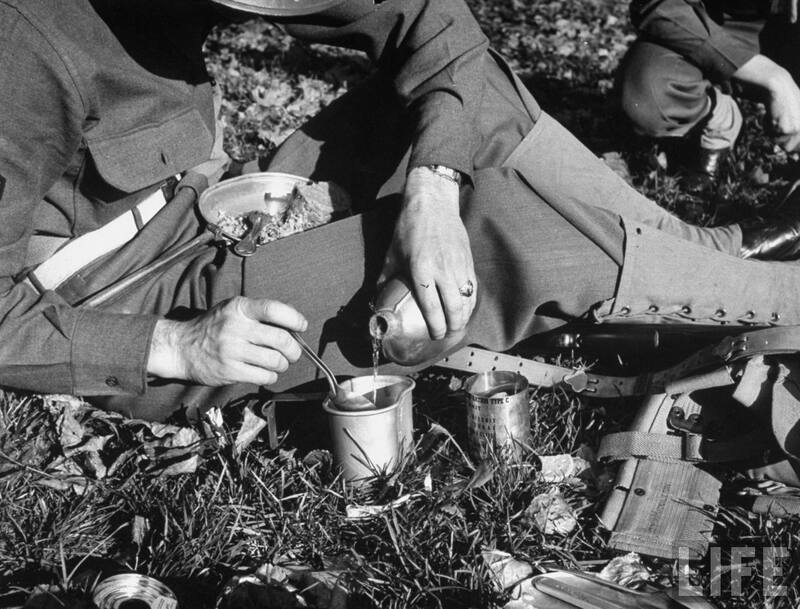 A can of Meat & Vegetable Stew is warmed up during training, 1941. Men from the ordnance company of the 101st AB Division hand out C ration to the newly liberated population in Normandy. 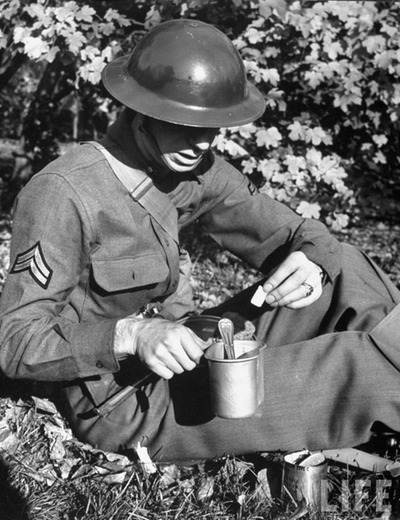 82nd AB trooper eating M-unit with a trench knife, Normandy. 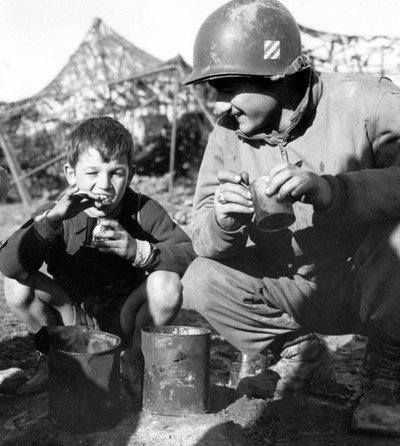 Two tired and dirty soldiers of the 9th Infantry Division 'enjoy' hot C rations. 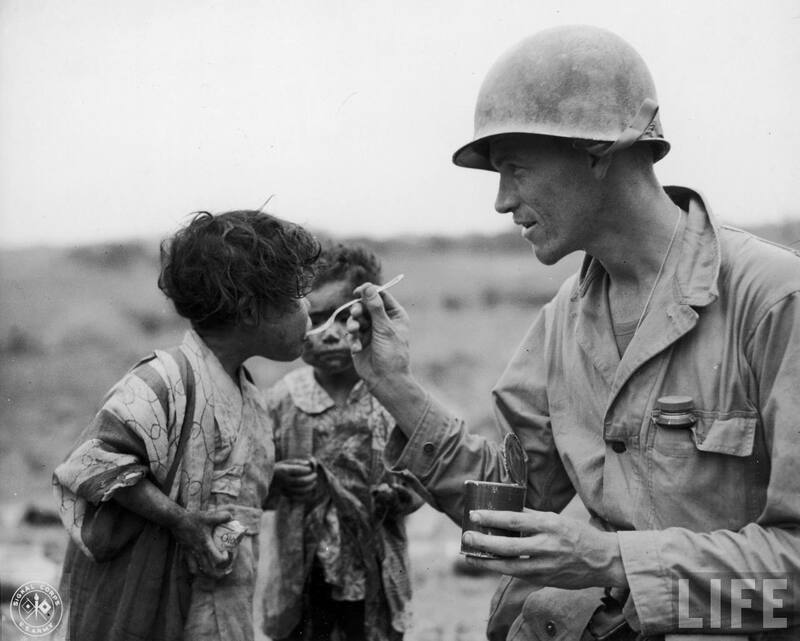 U.S. Army Lt. Richard K. Jones shares a C ration with Okinawan children. 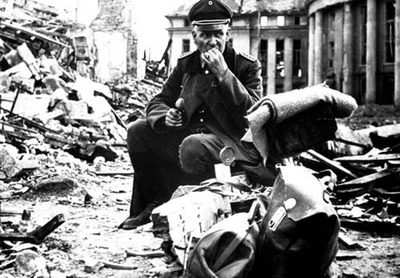 German officer is eating a can of C-rations in the ruins of Saarbrucken. A GI from the 3rd Infantry Division shares a C ration with a little boy, Italy. A T-patcher (36th ID) prepares dinner from C rations, Italy. An opened case of C rations is carried on the glacis plate of the Sherman tank. Willie and Joe heating C rations, cartoon by Bill Mauldin. 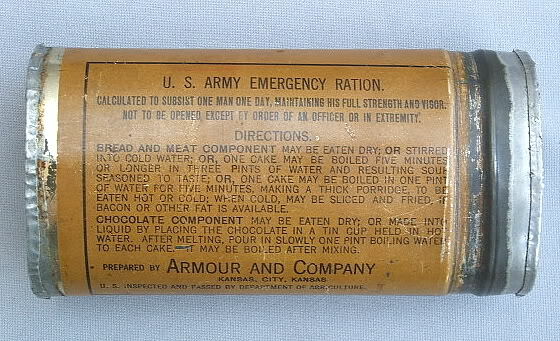 During WW1 the doughboys were issued a canned ration that was considered for emergency use. This ration consisted of three cakes of 3 ounces each, consisting of a mixture of beef powder and cooked wheat pressed solid. 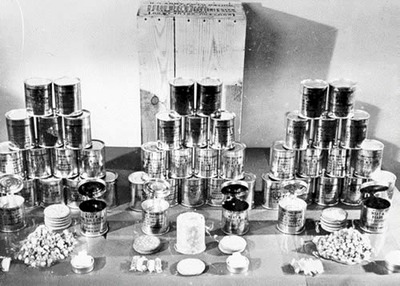 Supplemented with three 1 ounce cakes of sweet chocolate, this ration was packed in an oval-shaped can weighting approximately 1 pound. Nicknamed the "Iron ration", it was obviously highly unpopular and discontinued in 1919. A new ration needed to be found. The total calorific contents was grossly overrated and actually contained 2000 calories. It was decided that a emergency ration therefore should consist of six 12-ounce (square) cans constituting of 3 cans No. 1 Unit (a meat product) and 3 cans No. 2 Unit (the bread component). Due to low production of square 12-ounce cans, 15 oz. cylindrical cans (300 x 407) were substituted. 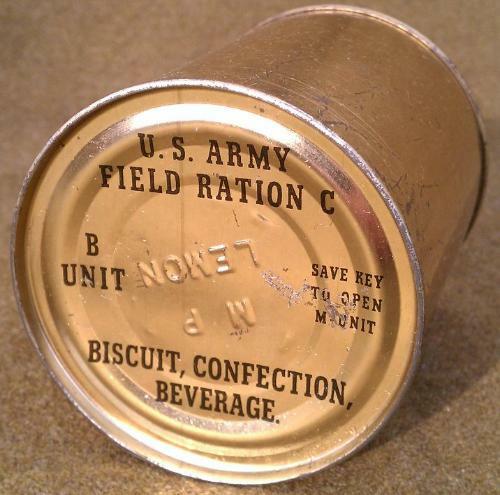 In 1939 a ration was accepted as the new emergency ration consisting of three 15-ounce (cylindrical) cans containing three varieties of the M(eat) Unit No. 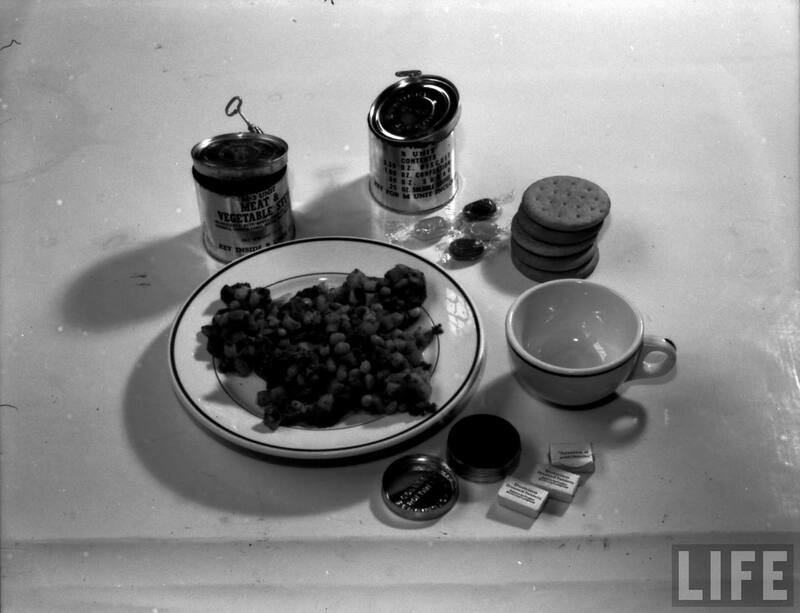 1: M1, M2 and M3 (Meat & Beans, Meat & Vegetable Hash and Meat & Vegetable Stew), and three 15-ounce cans of the B(read) Unit No. 2 cans. One meal consisted of one of the M-unit varieties and one B-unit. The Bread unit contained 4.5 ounces of biscuits, 0.5 ounce of sugar and 0.3 ounce of pure soluble coffee. 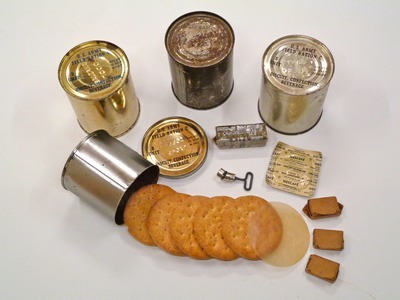 This rations was standardized as the "U.S. Army Field Ration C". 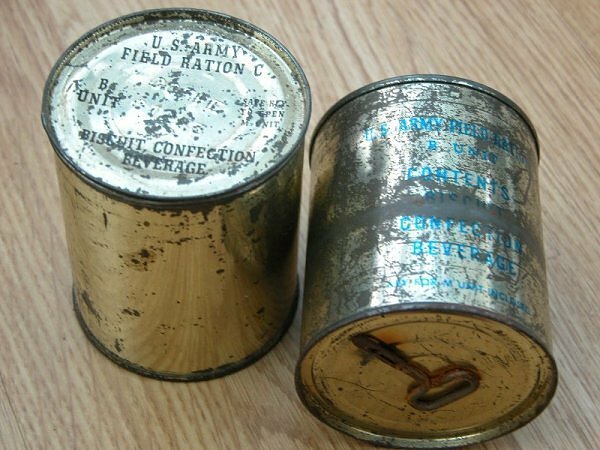 During tests it was found out that the ration contained to much food and in 1940 the size of the cans were reduced to 12-ounce (cylindrical) cans. From now on all cans are of the cylindrical type, size 300 x 308. This means that the internal dimensions of the cans are 3 inches in diameter and 3 8/16 inch high. With the reduction of the size a confection was added to the Bread unit. As of 1941 the B-unit contained 2.5 oz. of biscuits (5 each), 0.5 oz. of sugar (3 individually wrapped cubes), 0.25 oz. 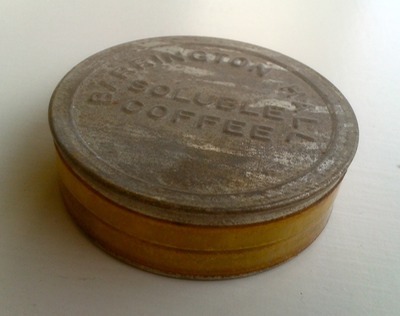 soluble coffee (packed in a small can, sealed with tape) and 1 oz. of a chocolate fudge. The Meat units stayed the same although reduced in amount. The total weight for one ration (six cans) is 4 pounds and 8 ounces. 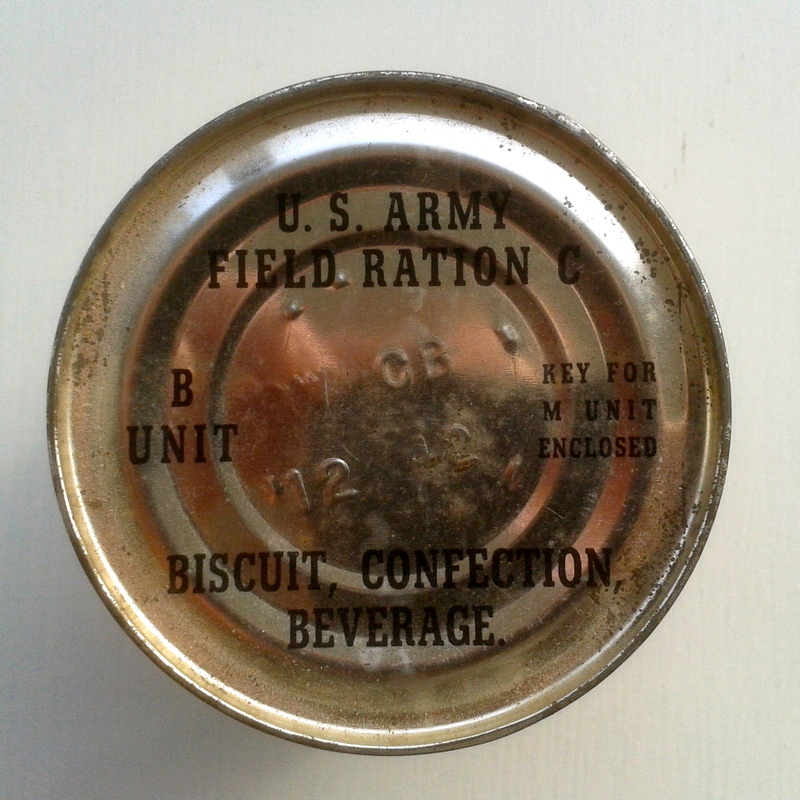 Originally there were three types of biscuits considered for the C ration, providing a different kind for each meal. For the ease of production and procurement only one type was accepted. This biscuit, however, was received enthusiastically during field tests and was also produced in a rectangular shape to be used in other rations and referred to as "biscuit type C-square". Five biscuits with the glassine disc. 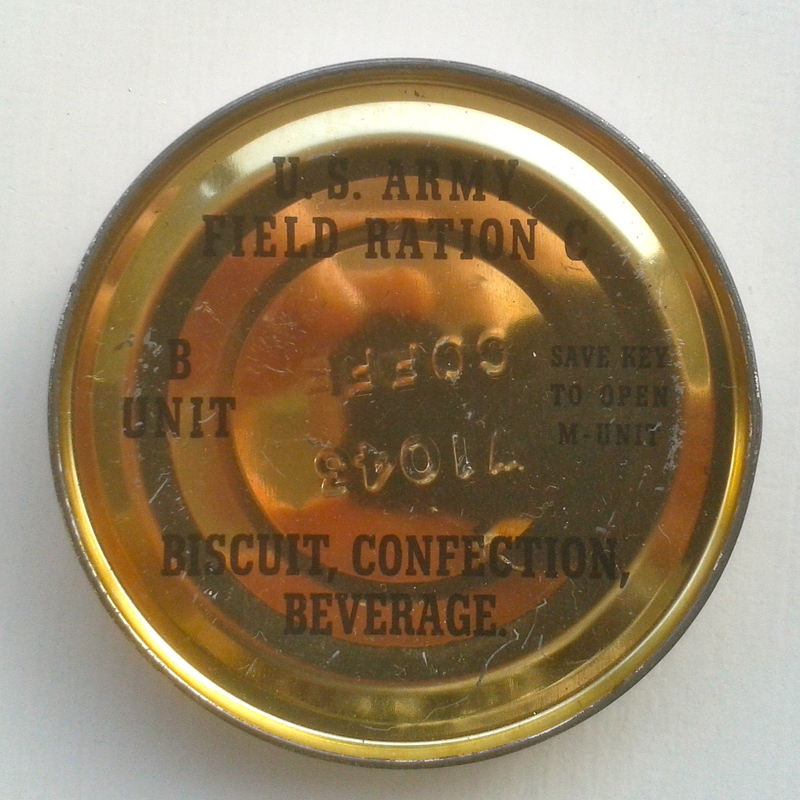 Reports from the battlefields were less positive and in late 1943 new varieties of the biscuits were developed. 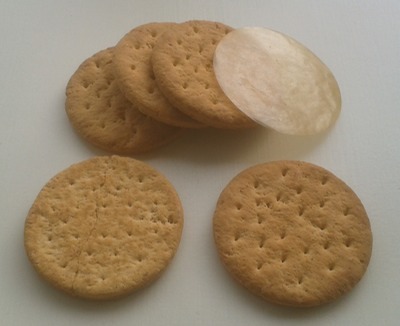 In June 1944 three varieties were accepted for the C ration: A bread biscuit (an improved Type C biscuit), a neutral biscuit made with white flour only and a soda cracker (of the same type as the saltines used in the K ration). One type was packed in a can, but each of the three cans contained a different type. Hereby the biscuit variety coming full circle. Around the same time a disc of compressed mixed cereals was developed and replaced one biscuit in the breakfast unit. This could be eaten dry or crumbled into some water making a porridge. 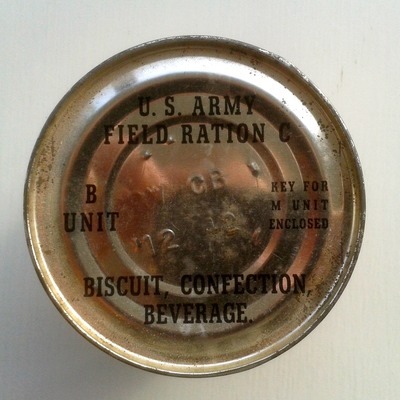 Early 1943 it was suggested to add a cookie in the ration, substituting a biscuit. The biscuits were considered to be eaten with the Meat component, so the cookie could be eaten with the coffee, providing a kind of desert. Since the keeping qualities of cookies packed with other components were unknown and the fear that it might alter the taste of the biscuit or go rancid altogether, the idea was dropped. 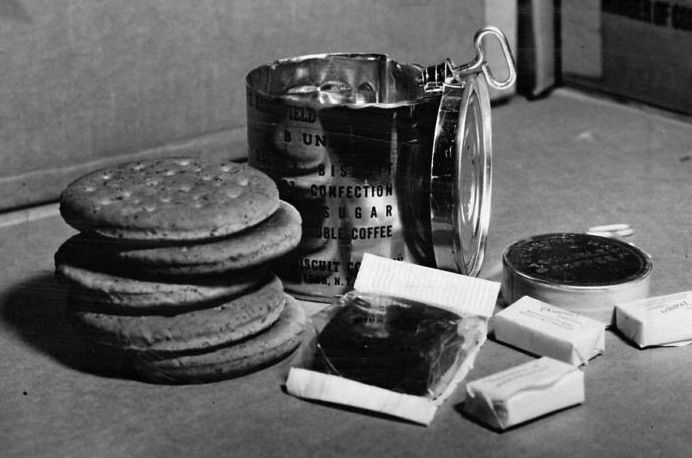 Late 1944 a new developed butterscotch cookie was included in the dinner unit, replacing a biscuit. To make the biscuits more palatable 1.5 ounce of fruit jam was include in the supper unit, replacing a biscuit. The jam was packed in a drawn metal can closed with a metal lid secured with a aluminum wrap-around strip. This was done in the fall of 1944. With the reduction in the size of the cans the number of biscuits went from 9 to 6 biscuits and with the inclusion of a confection there was only room for 5 biscuits left. And finally one biscuit was to be replace with a cereal disc in the breakfast unit, a cookie in the dinner unit and a can of fruit jam in the supper unit. So in the final version of the C ration there were only 4 biscuits in the bread unit. Pure soluble coffee in slip-type can sealed with tape. To wash it all down, coffee was included. In the original ration all three B-units were the same. Each contained a small aluminum foil envelope of pure soluble coffee. This coffee could be dissolved in either hot or cold water. The 15-ounce cans contained 0.3 oz. coffee, but his proved to make a too strong brew. After tests it was decided that 0.24 oz. was enough for one pint of strong coffee. For the sake of easy computing it was decided to reduce the amount from 0.3 oz. to 0.25 oz. Packaging the coffee proved to be quite a challenge. Soluble coffee is a very hydroscopic powder and needs to be packed in a hermetically sealed container. 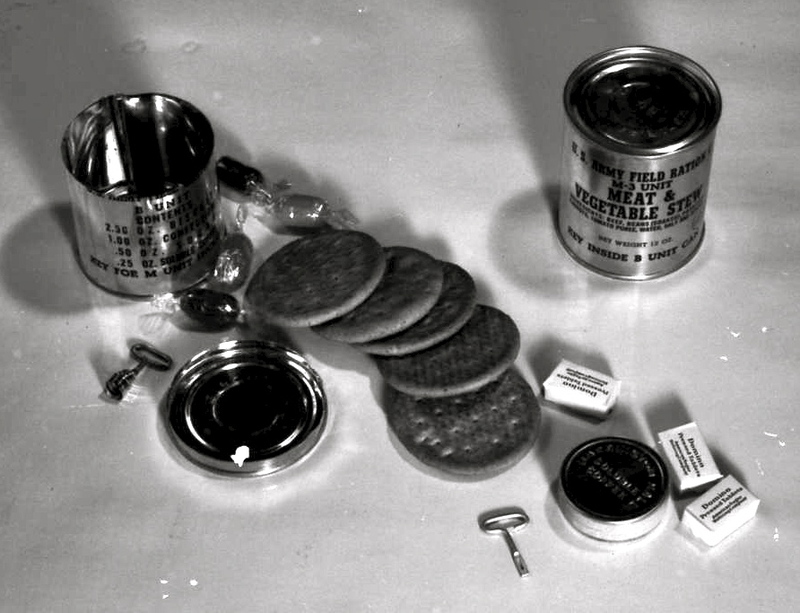 Since aluminum was a strategic material and could not be obtained in sufficient quantities, the first container used in mass procurement was a small can with a slip-cover that fitted tightly onto the bottom part. The seam then was sealed with adhesive tape. Often the tape wasn't adhered properly and moister creeped in, turning the soluble coffee into a solid block. A solution was found when a drawn type of can was developed that closed with a plug type lid. The seam then was closed with wax. When limitations on the use of aluminum eased, an envelope of aluminum laminated to cellulose acetate was developed. This proved to be superior tot the cans used so far. With the introduction of the laminated envelopes the amount of coffee was reduced to 5 grams (1.7 oz.). These are the same packages that were now used in the K ration. 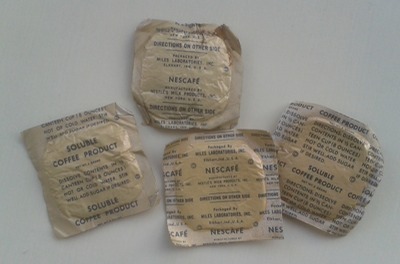 Soluble coffee product made by Nestlé in aluminum envelopes. The original specifications called for pure soluble coffee, but in 1940 the Nestlé Milk Company marketed a new product under the name of Nescafé. This was a soluble coffee with maltose, dextrine and dextrose added for a milder flavor. Since this coffee product proved to be far more popular than the pure soluble coffee the specifications ware altered to "soluble coffee and/or soluble coffee product". In 1942 a soluble tea was considered to present some variety, but could not be obtained at that time and the idea was dropped. 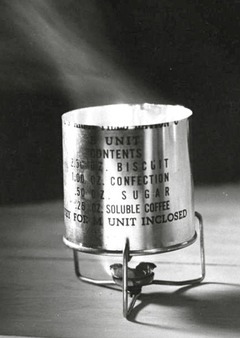 During a field test of rations in early 1942, a soluble cocoa beverage was substituting the coffee in one of the B-units. This was received positively by the troops testing the ration. 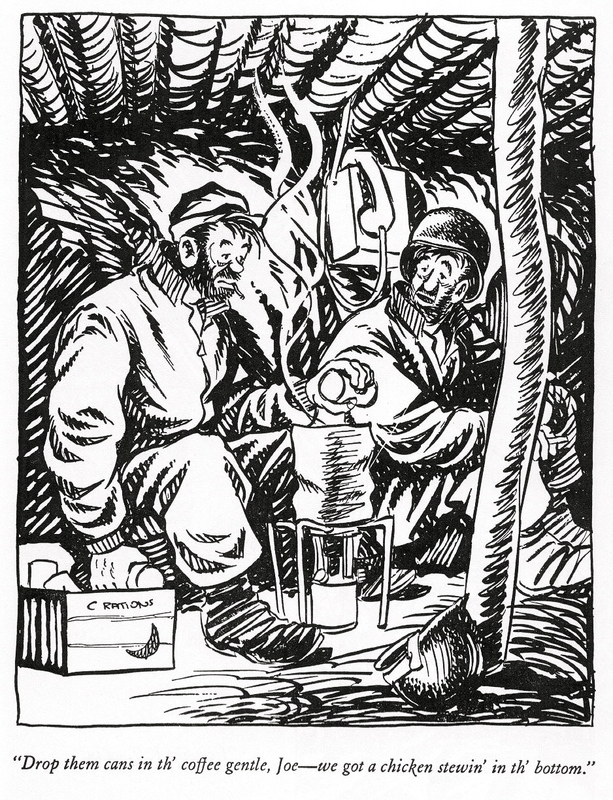 Also a new synthetic lemon juice powder that was used in the new K ration was well received, probably because it makes a better drink with cold water. to provide variation to the B-units it was suggested that in two units the coffee was replaced with the lemon juice powder (7 grams) and the cocoa beverage (2.5 oz.) respectively. The lemon juice powder was packed in the same style of envelope as the coffee, but the cocoa beverage was packed in a laminated bag of parchment and glassine. 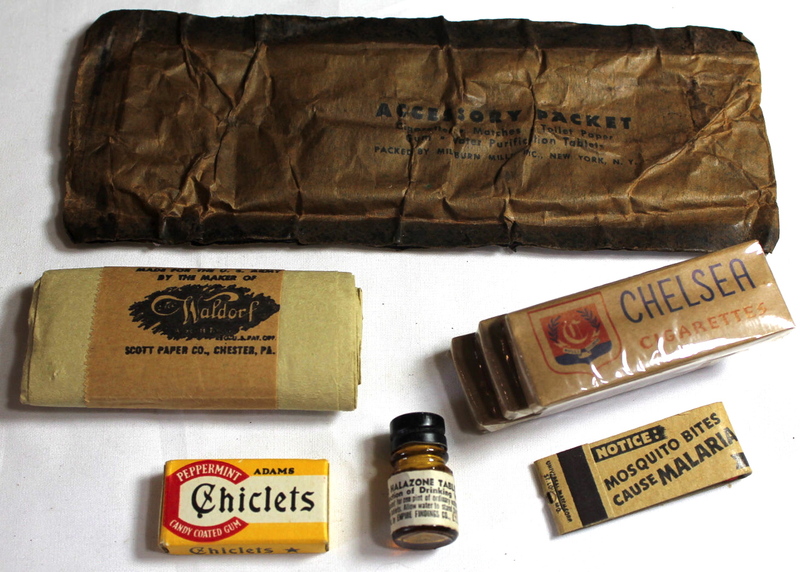 Due to shortages of the parchment/glassine laminate a cellophane bag was also allowed to be used. Later the cocoa came in a compressed disc. Later the lemonade was supplemented with a synthetic orange juice powder and grape juice powder. (Embossing would read either LEMON, ORANG(E) or GRAPE.) The bouillon powder that was developed for the K ration was not used with the C ration. To sweeten the coffee 3 individually wrapped sugar cubes (or, tablets or lumps) were included. The sugar was obtained from commercial sugar companies. Most of these companies used their commercial sugar packagings and carried fancy printing of their logos and slogans on the wrappings. 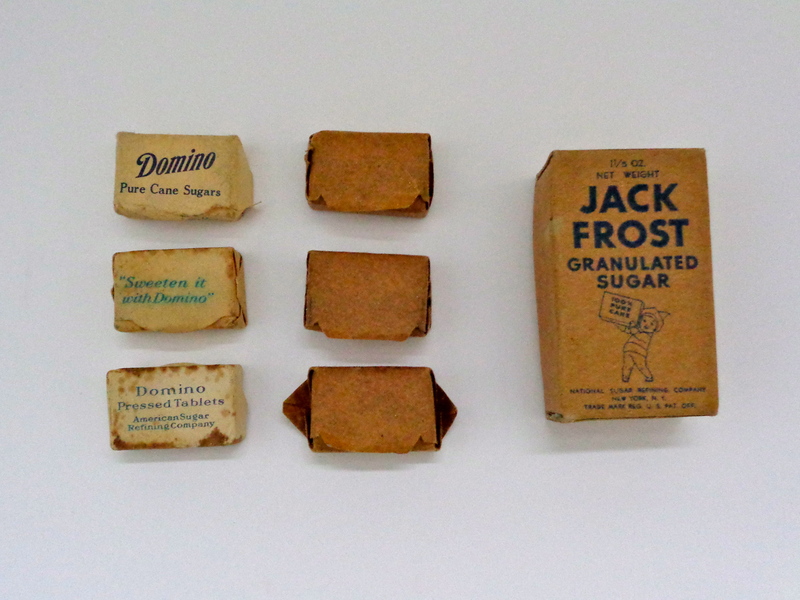 Domino and Jack Frost seems prevalent. Plain brown wrapping was also used. The amount of sugar included increased greatly during the evolution of the C ration. Three sugar cubes were provided to sweeten the coffee. (Labelled as 0.5 oz. sugar on the can.) This was later increased to four cubes (0.8 oz.). Sugar tablets with the Domino logo and the plain brown wrapping. 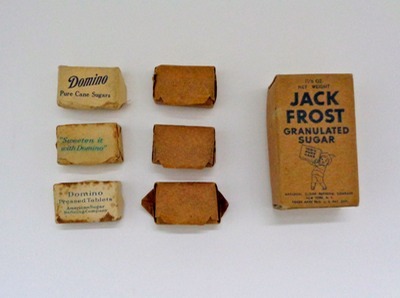 On the right a small Jack Frost sugar box that was included with the C ration containing the Lemon or Orange juice powder. The lemon juice powder itself has an acid taste and requires a lot more sugar to make it potable. In its infinite wisdom the Army provides the soldier with twice as much sugar for the lemonade than for the coffee. Where the coffee needed only 3 cubes, the lemonade came with 6 cubes! An alternative to the six cubes was a small package of 1.2 ounce of granulated sugar. Later compressed, paper wrapped disc of granulated sugar was also developed of 1 2/3 oz. (1.66 oz.) for the lemon or orange juice powder. This disc was easier to pack into the cylindrical cans than the six tablets or a rectangular package. With the cocoa beverage was no sugar needed since the sugar was already pre-mixed with the cocoa and milk powder. Left - the new caramel candies, five candies packed together. Right - a dried out chocolate fudge. To increase the calorific contents of the size reduced rations, the inclusion of a 1 or 2 ounce chocolate (D-)bar was considered. This was not deemed feasible because of taste transfer from the chocolate to the biscuits. However, with new packaging developments a new type of chocolate fudge was developed that could be included with the B-unit. The 1 ounce fudge was fortified with vitamins of the B complex. Complaints from field tests indicated that the fortified chocolate wasn't palatable after prolonged storage. An alternative was sought in hard candies. The flavors finally chosen in August of 1941 were lime, lemon, orange and butterscotch. At first these candies were of the square type that were easier to machine wrap, but proved to be more difficult to (machine) dump them into the cans on the assembly line. Later cylindrical shaped candies were used. An alternative used was a round shaped candy. A caramel candy was accepted in late 1941 as a substitute, but was three months later discontinued due to poor keeping qualities. This B unit still has it's label lithographed on the body of the can, but has the new plug-type coffee container on which lies the enclosed extra key. Note the bright colored hard candies. 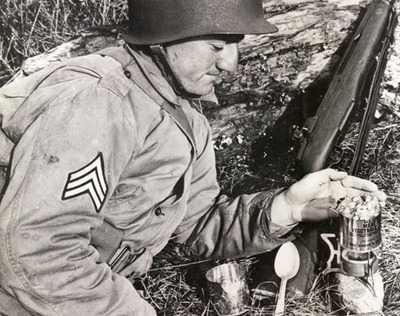 The reason for adding hard candies was based on the idea that the candies were consumed in between the meals, providing the soldier with extra energy throughout the day. The original amount of one ounce proved to much candy for the average soldier and the amount was reduced to 3/5 of an ounce. 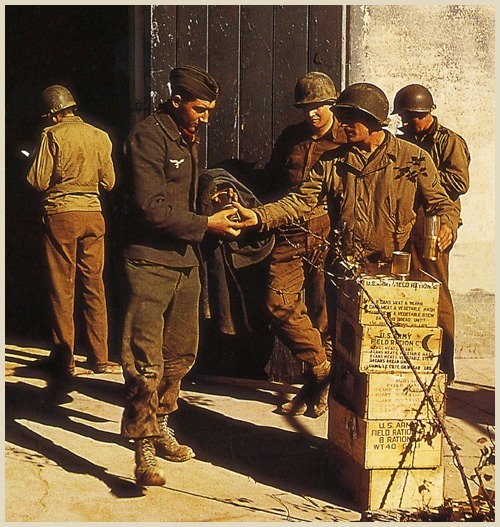 In 1943 a new caramel candy was introduced and included with the C ration. 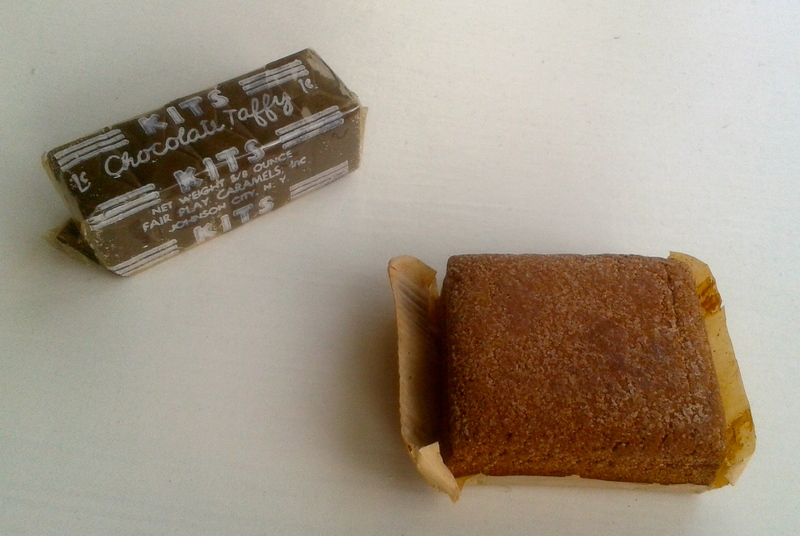 Some of these caramels were of the individualy wrapped square type, others were packed five together in one package and then included in the breakfast ration. At this time the fortification with vitamin C was being studied and ascorbic acid was added to some of the hard candies. In the summer of 1944 a new candy, candy coated peanuts, was added to the menu. 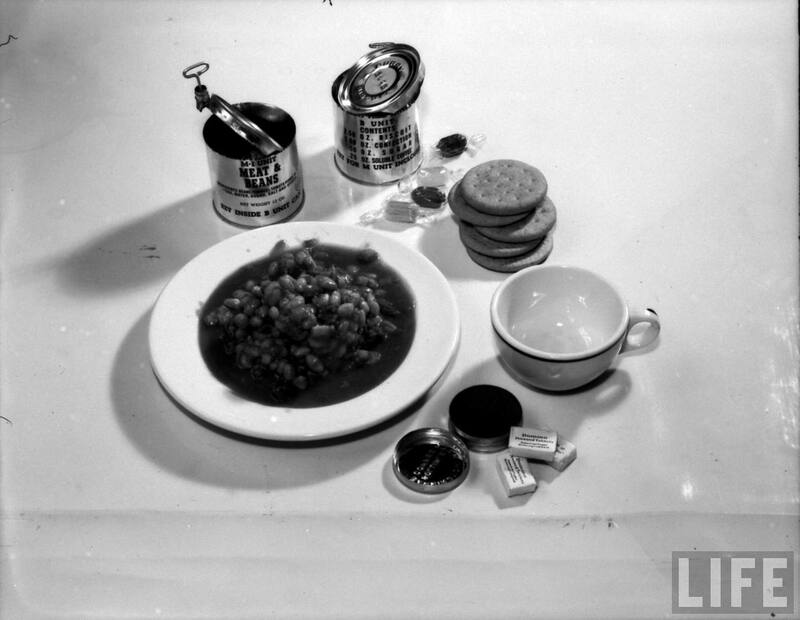 As of the summer of 1944 the confections for the breakfast unit was a small glassine envelope with 1.2 oz. of candy coated peanuts, the dinner unit held the 5/8 oz. or 1 oz. of caramels. 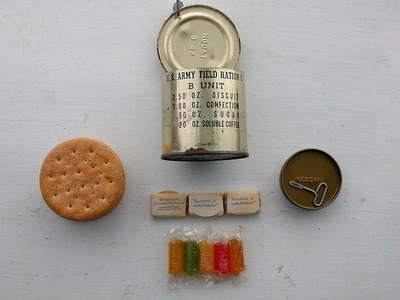 The supper unit still contained the hard candies, but now fortified with vitamin C.
Still new varieties were developed and as of 1945 there was also a chocolate fudge disc and a envelope of chocolate drops added. Making a total of five types of confections for the six bread menus used. It must be noted that the quantity is not always correct, some times the filling was done by hand and by mistake more or less candy could be included, or a filling machine wouldn't function properly. The same goes for the number of sugar tablets, or even an extra coffee envelope could be inserted by mistake! Also, all changes were incorporated into the production line, sometimes even in the middle of a production run. Old stock cans with the lithographed label on the body could be used with the new components. While some companies were using the new camouflaged cans, others were still using the plain ones until that old stock was used up too. So dates and contents of the cans may not correspond with the acceptance date of the changes. It was found out that the biscuits and the sugar don't go to well together. To prevent contact, a glassine disc was placed on top of the biscuits in the units containing the coffee and lemonade. If the granulated sugar was used instead of the sugar cubes the envelope containing the lemon juice powder was to placed between the biscuits and the package of sugar. Since the unit with the cocoa beverage contained no sugar a glassine disc was not needed. Later specifications also called for a glasine disk to be placed between the bottom of the can and the biscuits. 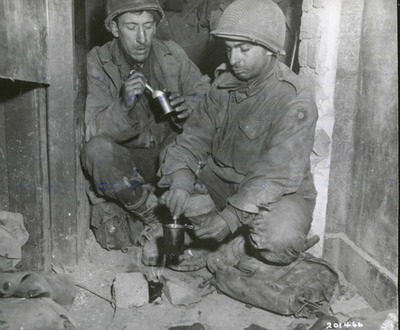 The inclusion of cigarettes were considered and in march 1943 a small package of 3 cigarettes were included in the units containing coffee and lemonade. Since the cocoa beverage packaging was quite bulky, there was simply no room to insert a package of cigarettes. The inclusion of cigarettes in the ration was soon discontinued, probably because the cigarettes impaired the taste of the food. Early 1941 an extra key for opening the M-unit was included with the B-unit, but was discontinued late 1942. 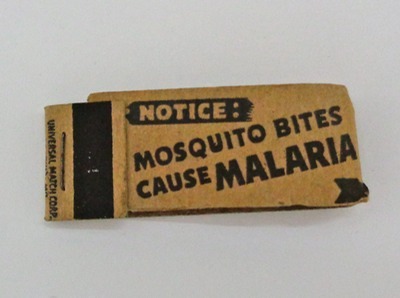 More on this in the Packaging section. Originally referred to as Pork and Beans, the meat consisted of pork and beef due to shortages of pork. 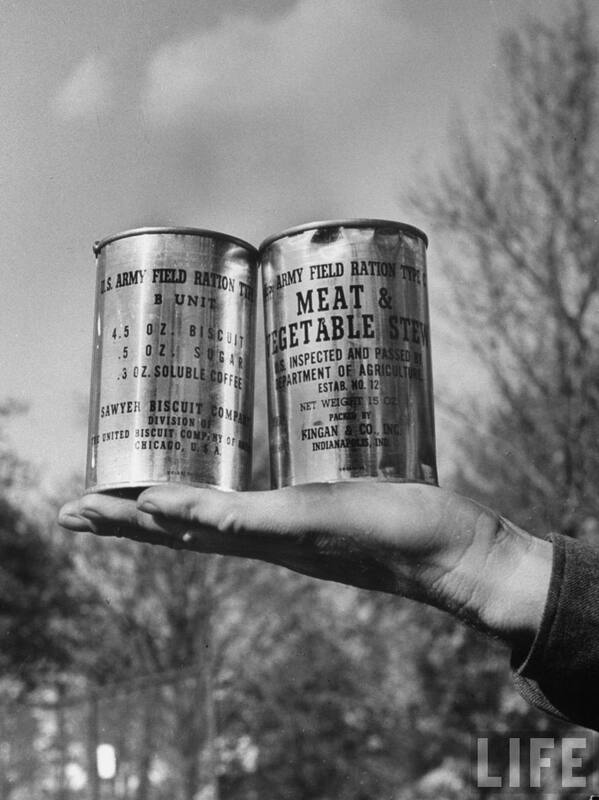 When the ration was standardized it was named Meat & Beans. The formula for the Meat & Beans was 25% beef, 25% pork, 20% beans and 30% of a tomato product or sauce. A little flavouring was added to finish it. In 1942 the beef was increased to 40% and the pork reduced to 10%. The Meat & Vegetable Hash turned out to be the least popular variety, sometimes referred to as dog food! The formula that made it so unpopular was: 40% beef, 10% pork, 48% potatoes and 2% unions with salt, celery salt and pepper added. In 1941 the use of dehydrated potatoes was authorized to speed up production and in 1942 in lieu of fresh unions the use of powdered dehydrated unions was also permitted. Meat & Vegetable Stew was the third M-unit and the original specifications only called for beef, but during production it turned out that the beef didn't contained enough fat to prevent sticking during the cooking process. A 10% pork was substituted for beef early 1943. Now all the meat units contained beef and pork in the same proportions. The formula for the stew is 50% beef (later 40% beef and 10% pork), 15 % potatoes, 15% carrots, 8% beans and 12% tomato product with the addition of the same seasoning as the hash. Again dehydrated potatoes were permitted. In 1940 there was a concern about the amount of beans used in the C ration, so for a short while peas were used in the M3 unit instead of beans. Although the search for more varieties continued, these three meat dishes were used throughout the war. In 1943 several fish products were tested. You either like or don't like fish, therefor the fish taste should be as little as possible, otherwise some soldiers won't eat it. However, there could not be developed a satisfactory fish product and the idea of a fish variety was dropped. The search continued and at the end of 1943 two more meat dishes were added: Ground Meat with Spaghetti, and English Style Stew. The latter was a new variety that was also used in the new 10-in-1 ration. In The spring of 1944 there were four more varieties added: (1) Meat & Rice, (2) Ham, Eggs & Potatoes, (3) Beef & Noodles, and (4) Frankfurters & Beans. 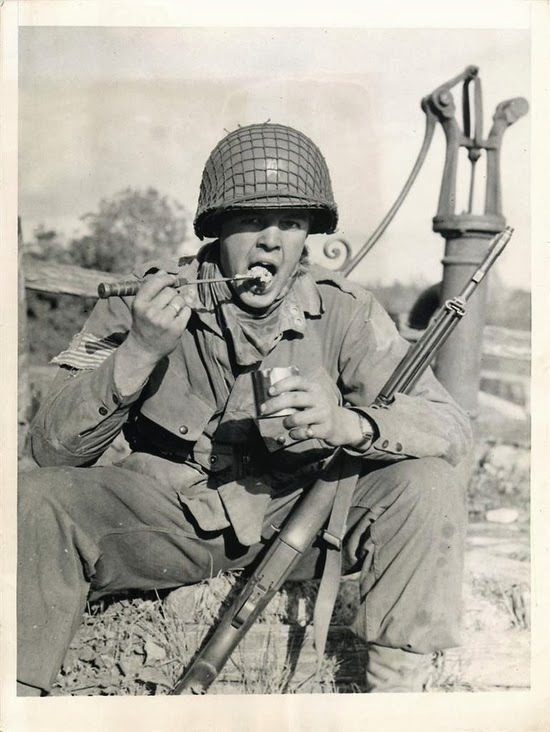 In June of 1944 eleven varieties were listed: (1) Meat & Beans, (2) Meat & Vegetable Hash [new recepy], (3) Meat & Vegetable Stew, (4) Ground Meat & Spaghetti, (5) Ham, Eggs & Potatoes, (6) Meat & Noodles, (7) Pork & Rice, (8) Frankfurters & Beans, (9) Pork & Beans, (10) Ham & Lima Beans, (11) Chicken & Vegetables. Apparently the English Style Stew was dropped by the end of 1944 and in 1945 the ever unpopular Meat & Vegetable Hash was dropped as well. The M units now being of ten varieties as was suggested in 1939, again coming full circle. Shown here are some components from the accessory kits. Left 12 sheets of toilet paper, next the P38 can opener on its envelope. At the top is a package with two tablets of chewing gum. Next to that a small bottle holding 12 Halazone tablets and a small vail with 4 salt tablets. Besides the short lived inclusion of the cigarettes the C ration only contained food. 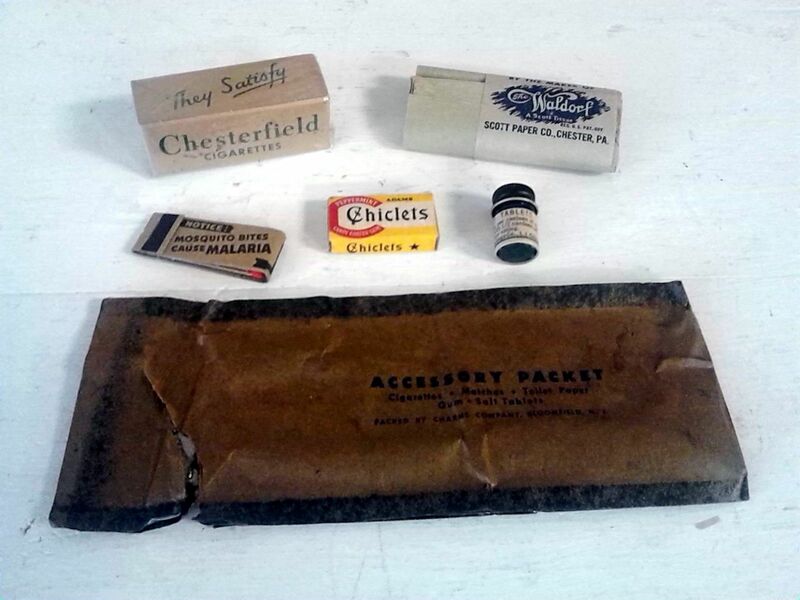 One of the advantages of the K ration were the inclusion of non-food items such as the cigarettes, toilet paper and matches. It was decided to develop an accessory kit that could be issued with the ration. By the summer of 1944 an asphalt paper laminate envelope was developed that contained a small package of 12 sheets of toilet paper. (The same as used in the K ration.) Two tablets of chewing gum, a small bottle with 12 water purification tablets (Halazone) and a matchbook with ten matches. Eight of these packages were inserted between the cans. One of these packages had a can opener added. Officially named "Opener, Can, Small, Induvidual", it is populary known as the P38 can opener. 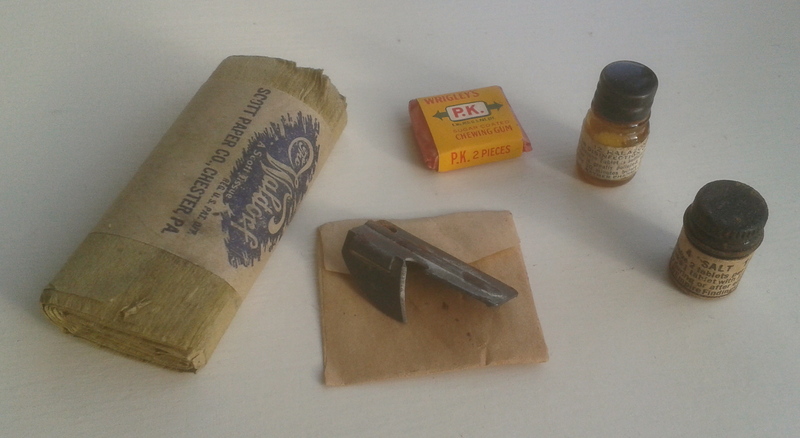 This can opener was inserted in a small brown envelop with instructions printed on it, the envelope than was packed inside the kit with the other components. 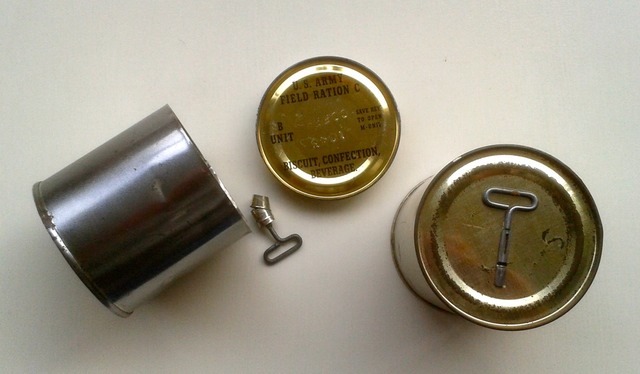 The accessory kit containing the can opener was stamped "Can Opener", or carried a label saying "Can Opener". In the spring of 1945 four salt tablets or a package of 1/2 oz. granulated salt and three wooden spoons were added and the Halazone tablets were deleted. 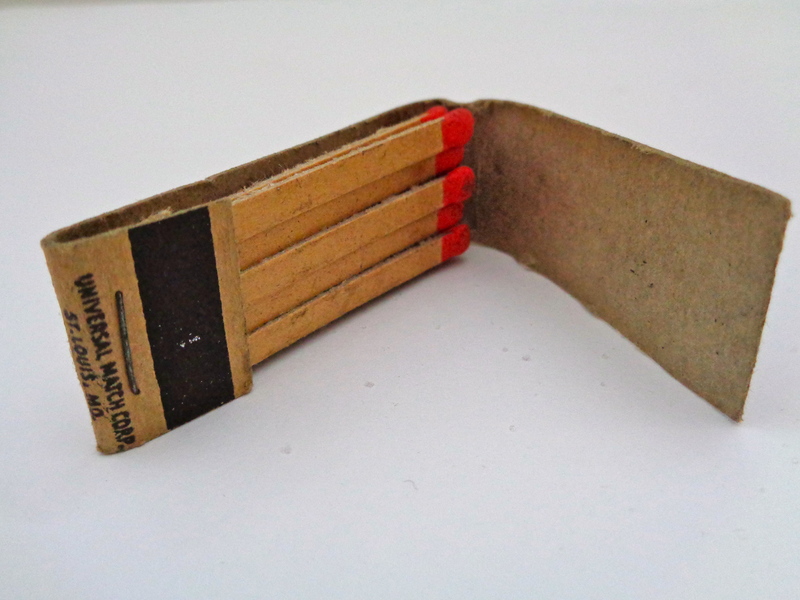 The cigarettes and matches were packed in a separate package and inserted between the cans. 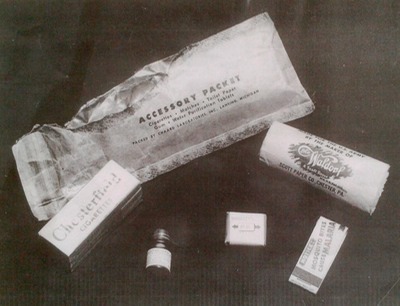 The accessory kit now was referred to as the Accessory Packet (Long) and the Cigarette Packet (Short). The cigarettes previously included in the cans were added to this accessory kit. 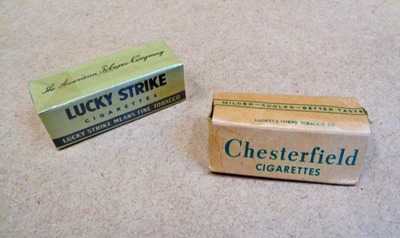 Two styles of packaging were used. 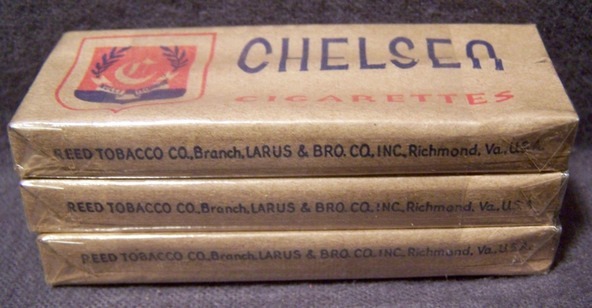 First, three packages of three cigarettes each were packed together with cellophane. This was probably done with the still existing stock that were made for the earlier inclusion. Secondly, when the stock of the packages containing three cigarettes were used up, a carton box was developed for nine cigarettes (three rows of three cigarettes). From the start the emergency ration was intended to be packed in tin cans. It was felt that this was the only means of packaging that was positively safe against gas contamination. One gas attack on a ration dump could render the thousands of rations collected useless. Even when tin became a critical material the C ration was to be packed in metal cans. 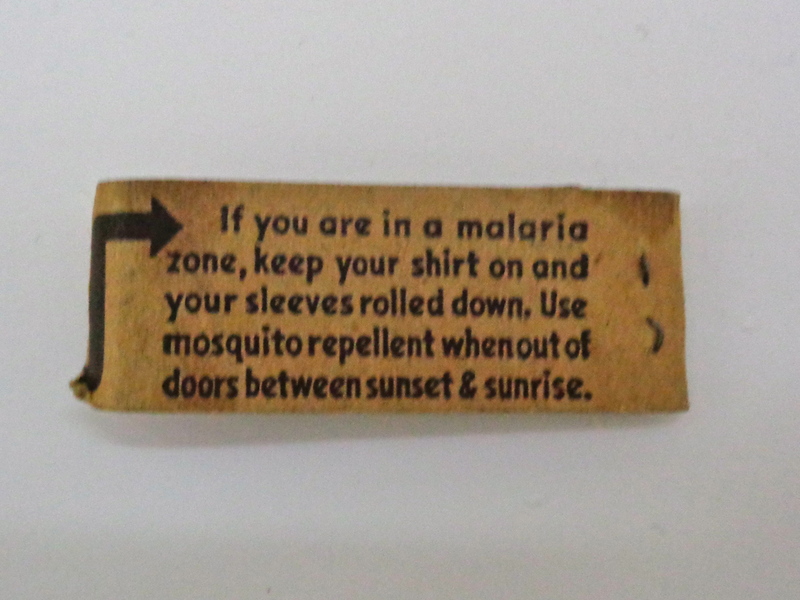 This would also protect the ration agains insects, a serious menace in the tropics. As mentioned earlier the original idea was to use 12 ounce rectangular cans. Since there was an insufficient manufacture of these style of cans the decision was made to use the commercial cylindrical cans. The reduction in size from 15 oz. to 12 oz. has already been mentioned. The cans used had a key style opening. That means that with a small wire key a band could be torn from the cans body separating the can in two. The circumference of the body had two scores that went around the body. The key was put over a small lip at the beginning of this band and, by twisting the key, to start opening the can. This style of key opening is still used with the modern corned beef cans. A drawback of this style of opening is that the contents of the Meat unit would spill since the score was lower than the filling of the can. To solve this problem the score was placed higher, but his would weaken the can. 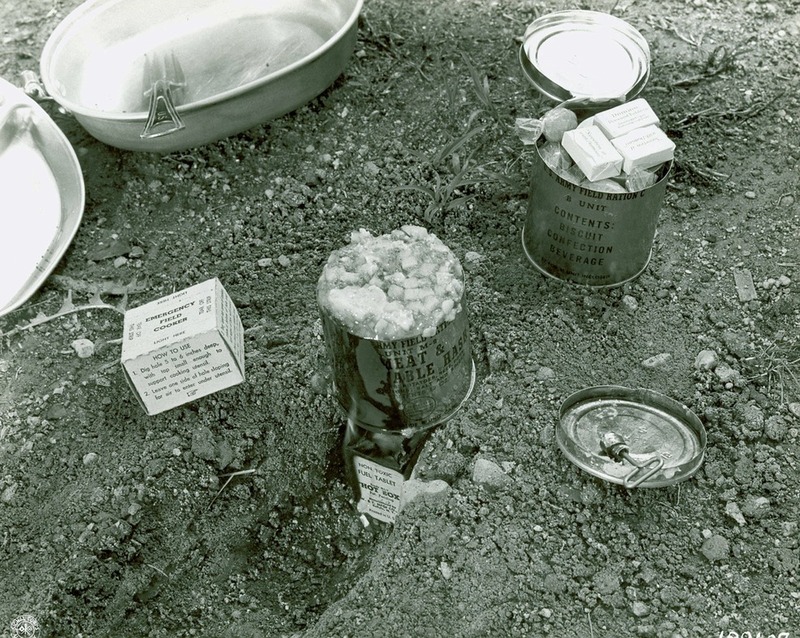 During tests the cans with the raised score would burst open when dropped. A final solution was found when the accessory kit with a small can opener was developed. At first both the cans for the M-unit and the B-unit were only tin coated, but since the M-unit was to be washed after closing a corrosion resisted coating was needed to prevent rusting. A clear or gold lacquer was used first on the M-unit only, but later on the B-unit as well. In late 1943 it was decided that all cans were to be coated with a non-corrosive olive drab camouflage coating. This was to be done when all existing stock of the clear/gold coated cans was used up. Note the blue lithographed label on the body of the can on the right, while the left can has the label lithographed on the top of the can. From the beginning the list of contents was lithographed on the body of the can. This was usually done in black, but blue, green or red ink was sometimes used as well. Labeling the body of the can had the disadvantage that the can needed to be lifted from the shipping case in order to identify its contents. In December 1942 it was decided that the label was to be placed on the top end of the can. The top that was labeled also carried the embossing of the establishment number of the manufacturer and the month and year of production. As mentioned earlier it also contained the embossing of the kind of beverage that was included. "Key inside B unit can"
The possibility to pack the B-unit in a non-metal container was also investigated. Although this would save strategic material and (shipping) weight, the fear for gas contamination and the relaxation on the use of tin as a strategic material ended this experiment. 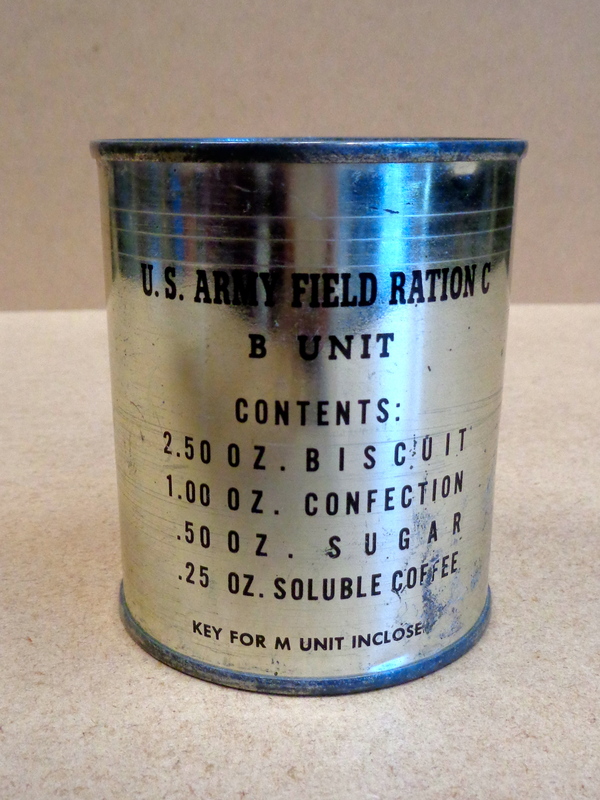 This idea would have made the C ration practically a K ration, but with a more bulky M-unit. 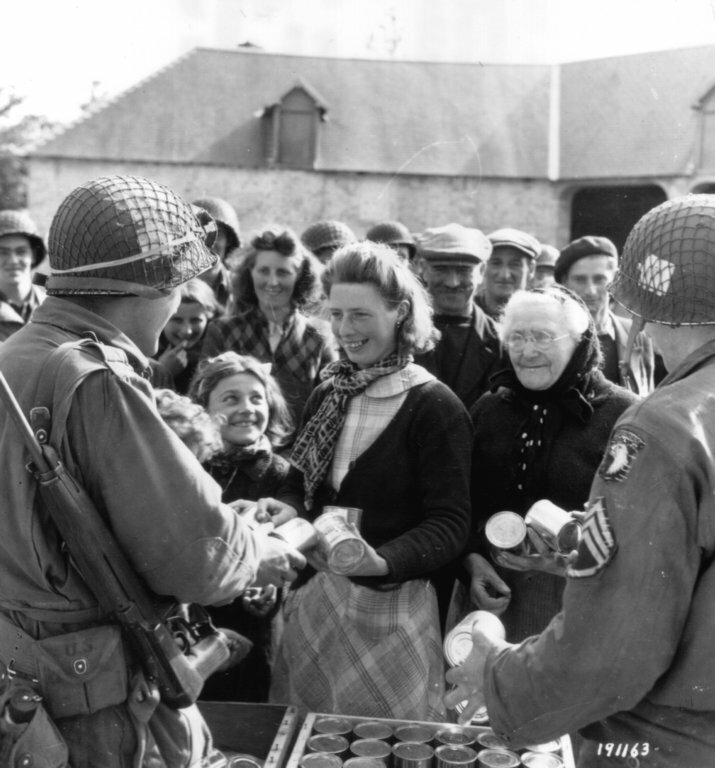 C ration are being handed out to German prisoners. 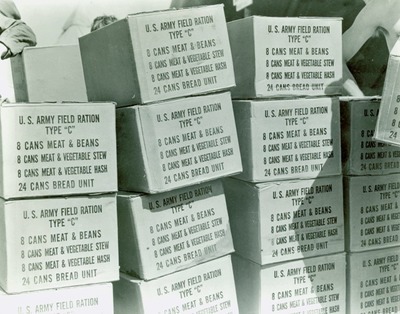 One daily ration constituted of six cans, eight rations were packed in a shipping box. There were four rows of 6 cans each in the lower tier of the case and four rows on top of these. The two tiers of 24 cans each were separated by a sheet of chipboard. By combining the ten meat dishes with the six B-units differently, six menus were compiled. The four rations in the lower tier were from one menu and the top tier were from another menu. Different packers combined different menus. 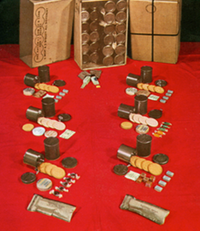 Eight accessory kits where inserted between the cans from 1944 on. One row of cans and a packet was one complete ration. For domestic shipping the shipping box was made of fibre board, but for overseas shipping a wooden crate was to be used. These nailed boxes were to be bound with three steel straps. One end of the case was marked with the solid crescent, identifying it as food and the label saying: U.S. Army Field Ration C, 8 Rations, Wt 40 Cu 1.1 (40 pounds and 1.1 cubic feet). On the side of the case the name of the contracter who assembled the ration and contract number as well as the stamp of the inspector. 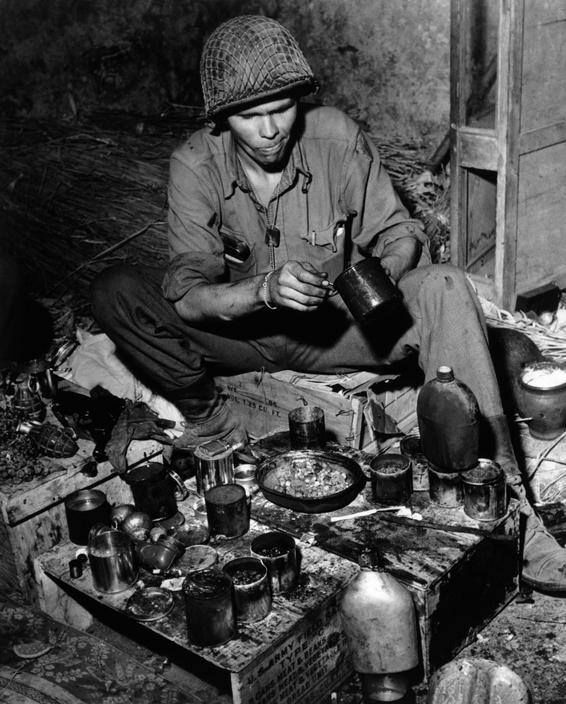 Not all soldiers understood that a complete ration consisted of six cans. Some soldiers were given only three cans as it was understood that one can was one complete meal, other received only B-units or M-units. To solve this problem a label was stenciled on top of the case saying TOP - OPEN HERE, ONE RATION - 1 ROW OF 6 CANS AND 1 PACKET, 3 MEAT & 3 BISCUIT, ALL DIFFERENT with an outline indicating one row of six cans. The C ration was the first serious attempt for a modern palatable emergency ration before the war. 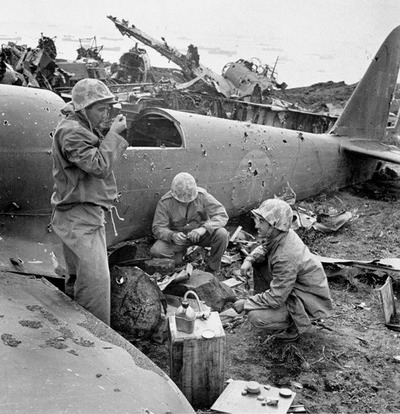 It was well received during tests, because it was better than the hardtack and ground coffee issued earlier. 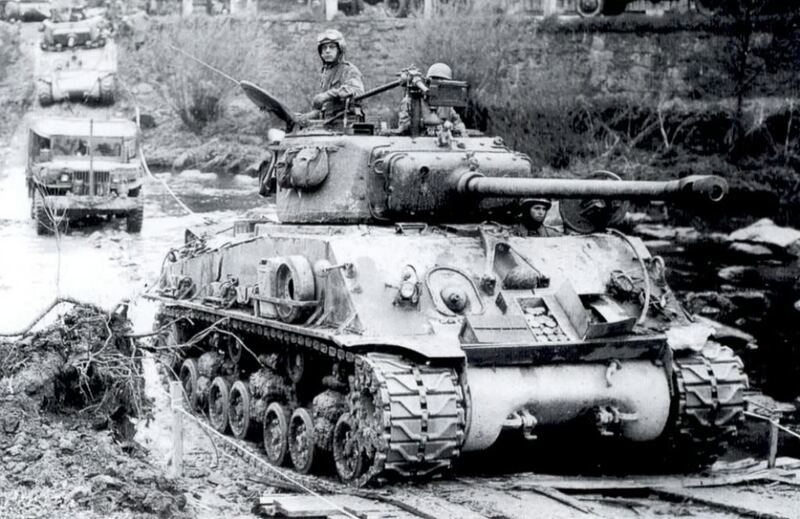 It was only intended to replace a missed meal or provide food for one day in the field, but with the mobile warfare introduced in WW2, soldiers would have to subside on it much longer. 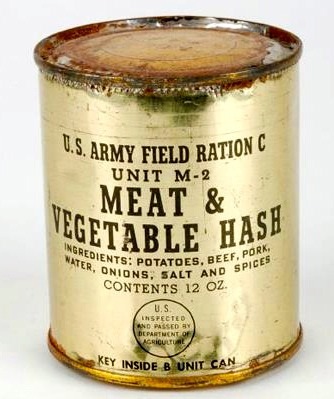 Sometimes It was the only food (besides the notorious K ration) that was available during a campaign. The monotony of the three meals was already noted and the search for more varieties continued. Although, old stock was issued throughout the war and some men never got the new ones. Most veterans only remember the Meat & Beans. It was also noted that the M-unit would improve a 100% if served hot. Later a small folding cooking stand was developed on which the can could be heated by lighting a heat tablet under it. 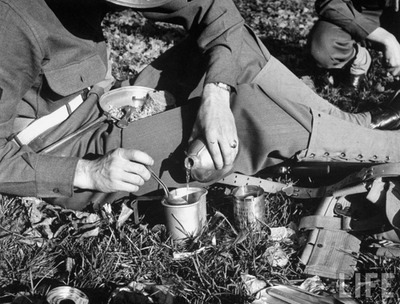 Since it was quite heavy and bulky to carry, the K ration won in popularity first. 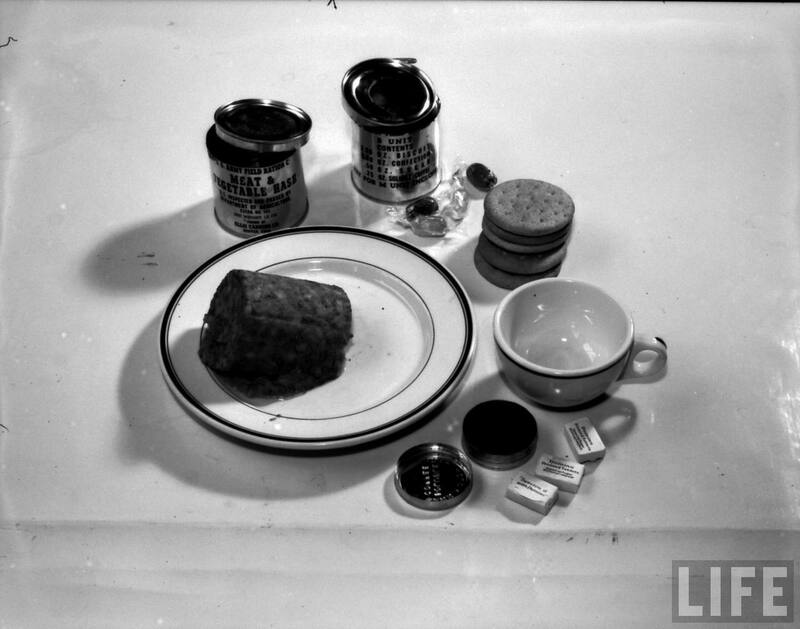 The advantage of the C ration, however, was that it contained a more bulky food, the meat unit would fill the stomach a little more than the K ration could. Another advantage was that the M-unit could be warmed in it's own container, if there ever was time for that. 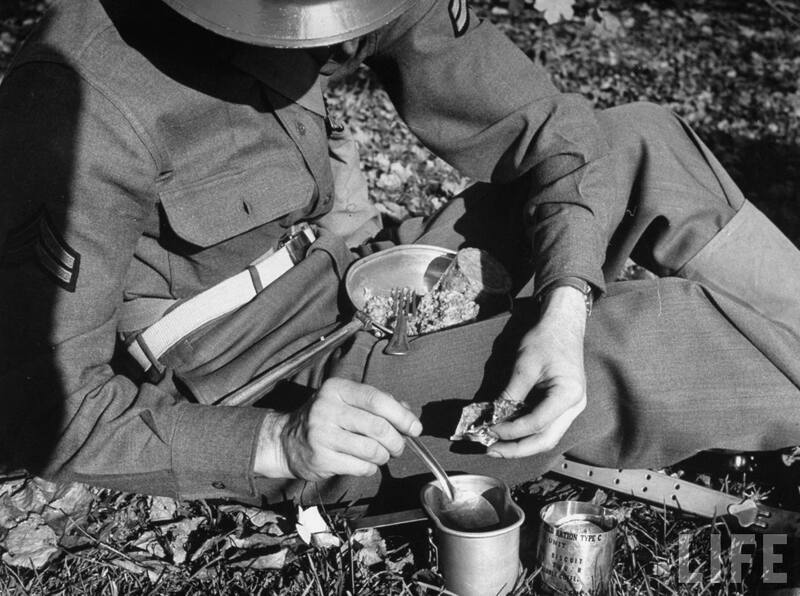 Although simpler than the K ration to use, it turned out that the use of the C ration during training was still feasible and the use of trainings films was recommended, and acted upon. Finally a beautiful record of the use of the C ration in Italy was made by an unknown amateur cameraman. His 8mm color film shows men of an artillery unit "enjoying" C rations.